So, you may be asking the same question I have…what exactly is a Buddha bowl? Well, I did a little research and basically, it’s just a trend where you create beautiful looking bowls that aren’t only pleasant to look at, but also really good for you too! From what I gather the only reason it’s called a “Buddha” bowl is that there is a “balance” – whether that is a color balance or a nutritional balance. Either way, these babies are super easy to make, delicious, and a perfect idea for meal prepping! My secret weapon for this recipe is Trader Joe’s Everything but the Bagel Sesame Seasoning Blend. It’s tastes exactly like an everything bagel and really seasons these bowls well. If you don’t have a jar of this handy…you could easily make it yourself! Here is a recipe I found over on One Lovely Life. I am using these Buddha Bowls as lunch this week. They heat up well and look pretty impressive! In a large non-stick pan, over medium-high heat, brown the chicken breast until cooked through. Remove from pan and set aside. In the same pan, over medium heat, cook the spiralized zucchini for 3-4 minutes. Remove from pan and place in the bottom of your meal prep container. Over medium heat, cook the bell peppers and tomatoes for 6-8 minutes. Remove from pan and place in the container. Over medium heat, heat the olive oil. Add spinach to the pan and allow to wilt, then add broccoli. When the spinach is wilted, but still has nice green color, remove from pan and place in the container. Keep the broccoli cooking until cooked to desired texture (I like mine to still have a little crunch!) Remove broccoli from pan and place in the container. Slice the chicken and place in the container. To make the dressing add all ingredients to a bowl and whisk together. Divide dressing between the 4 buddha bowls. Sprinkle with Everything But the Bagel Seasoning. Allow bowls to cool, cover with lids, and store in the fridge. When it’s time to eat, head in the microwave for 2-3 minutes! Nutrition: Calories 190, Protein 20.3g, Carbohydrate 18.7g, Dietary Fiber 6.5g, Total Sugars 7.9g, Total Fat 5.8g. New recipe! Low Carb Buddha Bowls! The BEST chocolate chip peanut butter bars are right here. The first time I ever made these and took them to an event, I had a line of people ready to shovel them into napkins so they could share them with all their loved ones! Every bite is like a chocolate peanut butter fantasy and they are similar to those cookies we would enjoy as a child. If you have a chocolate tooth like me, you would also like these black bean brownies, but sometimes we all need a change to take care of every element of our chocolate cravings! Right? There is no reason you cannot have dessert every day, especially when it is good for you! These can be vegan / gluten-free / dairy-free / sugar-free / grain free / keto / paleo / and oil-free! Grease an 8-inch baking pan and set aside. You will want these to be fairly thin in the pan so use something similar in size if you don’t have an 8-inch pan. In a mixing bowl, gently heat your nut butter. Stir in the applesauce and vanilla extract, and set aside. In a separate mixing bowl, stir together the baking soda, salt, flour, sugar, and chocolate chips. Pour the dry ingredients into the wet and keep stirring—it will seem very dry at first, don’t worry. ONLY if you need, add up to 2 tbsp milk of choice. Aim for a cookie dough consistency. Transfer the batter into the prepared pan, and smooth down evenly with a spatula or spoon. Press some chocolate chips into the top if desired. Bake 25 minutes or until top is brown. Leave them to cool for at LEAST 20 minutes, they will firm up. Smoking cigarettes is bad for your health but people still find it incredibly difficult to quit smoking. Among the many toxic components in a cigarette including benzene, tar, carbon monoxide and ammonia, none of them are quite as addictive as nicotine. Nicotine is the major culprit that causes the addiction and the component which makes it so difficult to quit smoking. But have you ever thought how long nicotine stays in a persons system? How Much Nicotine is in a Cigarette Exactly? To understand how long nicotine stays in your system, we must first learn how much nicotine is there in one cigarette. Cigarettes can contain up-to 20mg and as low as 8mg of nicotine in them. At average, 12mg of nicotine is present within a cigarette. However, you do not intake the whole 12mg when you smoke a cigarette. According to most data, you take almost 1mg of nicotine upon smoking one cigarette. So, the amount of nicotine absorbed from one cigarette is constant, the amount of cigarettes you smoke a day is the variable. The cravings smokers feel may be because of their higher levels of nicotine intake. On average, a smoker may have 30 nanogram/milliliter of nicotine present in his blood stream. It can increase and decrease based on the amount of cigarettes you smoke per day. The purpose of e-cigarettes is to decrease the amount of nicotine in each cigarette so eventually smokers can adapt to live with ineloquent amounts of nicotine. How Long Can Nicotine be Detected For? There is no set time for which nicotine can be detected. It depends on a number of factors. If the amount of tobacco smoked is in a large quantity and if the person being tested has been smoking for a number of years the nicotine can be detected for up to 3 months. How Long Does Nicotine Stay in the Blood? In blood tests, nicotine is usually identifiable usually after 1-3 days of use. The detection range can vary depending on the age and health of the user. It may take 1 to 10 days till nicotine is virtually undetectable in blood levels. However, this method of testing is not too compact as false positive results can be produced in certain cases. How Long Does Nicotine Stay in Urine? Upon inhalation, nicotine turns into cotinine which is excreted along all the wastes of the body in the form of urine. Nicotine is detectible in the urine for up to 3-4 days. Although for passive smokers, the nicotine may be detectible for more than 15 days. How Long Does Nicotine Stay in Saliva? This is said to be the most efficient way to test weather a person has traces of nicotine in their body or not. It can also provide an approximate amount of tobacco used by the person. 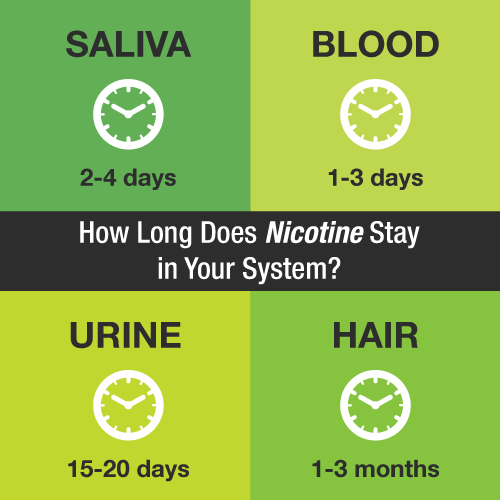 Nicotine can be tested in the saliva for more than 10 hours but if other factors weigh in, it can rise up to 2-4 days. So to conclude, nicotine can be found in the body for up to 5 months if some factors are favorable. Otherwise, it can fluctuate according to set factors so there is no precise time set in which nicotine is detectible in the body. For many people, eating healthier is on their list of New Year’s resolutions. While it’s easier to reach for fresh veggies straight from the garden or juicy fruits like peaches and berries in the summer, it’s harder to make yourself want to eat quite so healthy in the winter. But it is possible to eat your veggies and eat delicious comfort food this time of year. Take a look at these winter dinner menu ideas and start meal planning for next week! Nothing is easier or more elegant than a roasted beet salad. Roast your beets whole in aluminum foil for easy slicing and even easier clean-up. Turn Meatless Monday into Moroccan Monday with these delicious roasted cauliflower pita pockets. You won’t miss traditional lamb or chicken in this veggie take on a gyro. There are few veggies as versatile as cauliflower. All you need is an egg and parmesan cheese to turn a head of cauliflower into a grain-free and gluten-free pizza crust. Cauliflower steals the show when it’s sliced and grilled as a cauliflower steak. Even the most staunch meat and potato lovers will become veggie and quinoa lovers with this recipe. 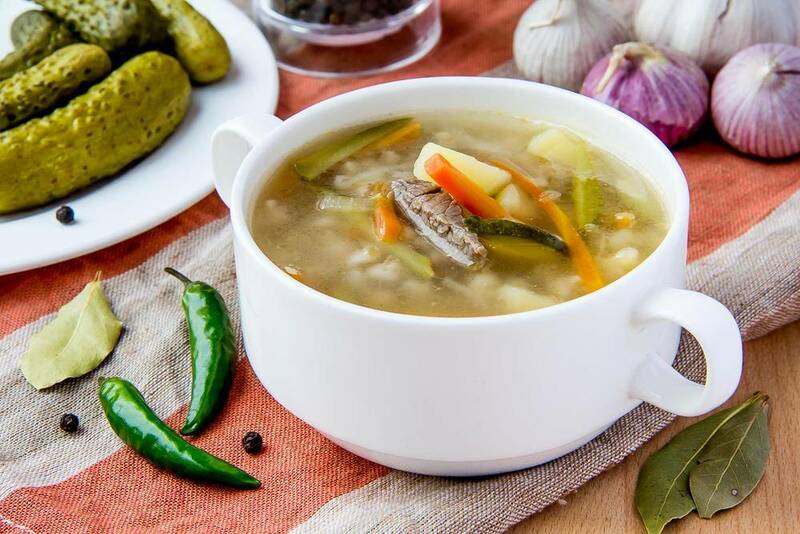 There’s nothing like coming home to a hot bowl of soup on a cold winter’s day. The best part about this meal is that you can make it on Sunday and have lunch or dinner for the entire week. If you’re looking to incorporate more kale into your diet, adding it to fried rice is a delicious and easy way to start. Use day-old rice and you’ll have dinner on the table in under 10 minutes. The orange and toasted coriander dressing makes a normal spinach and grain salad one worthy of a dinner party. Adding grains to a salad will keep you satisfied even longer. This would pair well with a roast chicken for a Sunday dinner as well! Who needs stuffed chicken breast when you can have stuffed salmon instead? This recipe is filled with spinach and sun-dried tomatoes, making it an easy way to get your veggies in for the day. Vegetarians and meat-eaters alike will go crazy for these delicious sweet potato and black bean enchiladas. This is a lighter version on a Mexican classic the whole family will love. Creamy sweet potato soup isn’t just healthy but fills the need for comfort food too. 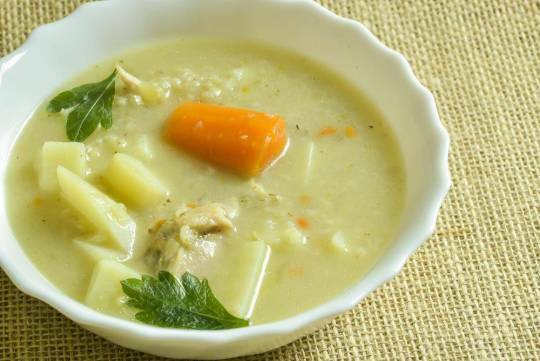 This vitamin-C packed soup will help keep you healthy during cold and flu season to boot. Sweet potatoes are the perfect complement to any winter dinner menu. This one-pot side dish is easy, healthy and delicious. 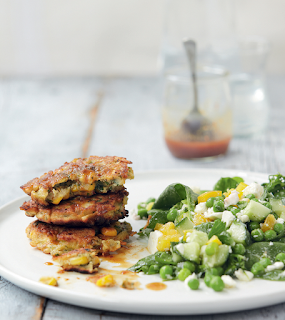 Make a weeknight dinner into a spicy affair with these spicy quinoa cakes. You can make the cilantro lime crema up to three days in advance so you can get dinner on the table even faster! This seasonal favorite gets an exotic upgrade with the addition of cumin, coriander and tomato paste. Serve this butternut squash dish alongside seeded bread or on top of brown rice to make it a complete meal. Take your carrots from ordinary to extraordinary with a simple honey and rum sauce. No one will have problems finishing their veggies when these carrots make an appearance! Give your carrots an Indian flare with the addition of garam masala. Garam masala is a sweet spice made by grinding up cinnamon, cardamom, clovers, peppercorn and nutmeg. These pair nicely alongside a chicken or pork dish for a warming winter menu idea. You’ll never buy a pre-made grocery store rotisserie chicken again after you roast your own chicken! Carrots, potatoes, turnips and onions are made extra delicious by the drippings from the roast chicken. If you’re going to have one staple on hand this winter, have oven-roasted vegetables prepped and ready in your fridge. You can add them to a salad, eat them with a protein of your choice, mix them into pasta or even eat them plain with hummus. Winter is crockpot season. Make this easy cabbage salad to pair with pulled pork made in the crockpot or with seared salmon. After a long day at work and fighting cold temperatures, the last thing you want to do is cook dinner. Make this delicious Brussels sprouts salad on Sunday for a delicious, healthy and pre-made dinner for the rest of the week. Even Brussels sprouts skeptics will be converts after they are served roasted Brussels sprouts. Crispy, salty and savory — these veggies are sure to cure any comfort-food craving this winter. As delicious as roasted Brussels sprouts are, sometimes you need them prepared a new way. Coconut, red chile and cumin give these veggies an Indian vibe. There’s not many desserts easier than baked apples. You’re sure to have the other ingredients — butter, brown sugar and cinnamon — in your pantry. Add a scoop of vanilla ice cream for an indulgent yet still healthy dessert. One of the most elegant yet easiest dessert are poached pears. You can either serve the poached pears in their sauce or serve with whipped cream or ice cream. The natural sweetness of sweet potatoes lends themselves to being a perfect cookie base. This delicious dessert could also be eaten for breakfast the next morning after a dinner party with a cup of hot coffee. If you’re looking for a pièce de résitance winter dessert, look no further than this coconut-pecan carrot cake with cinnamon glaze. This glaze is a healthier alternative to a traditional cake frosting. The cruciferous vegetables, broccoli and Napa cabbage add an additional powerhouse of nutrients to your linch or dinner. 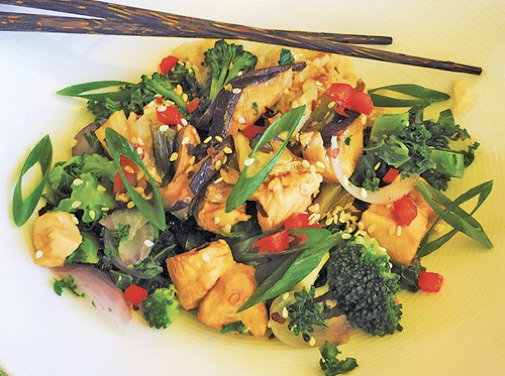 Enjoy this Asian-style bowl. It’s a meal-in-one! Optional: You can prepare ½ cup brown rice for this meal. Start cooking rice a few minutes before you begin cooking the meal. Follow directions on package for best results. Optional: Serve with ½ cup cooked brown rice. Chop or press garlic, and slice red onions and scallions, and let them sit 5 minutes. Separate broccoli florets with small stems from large, thick stem. Finely chop florets and small stems into ¼-inch even pieces. Heat 3 TBS of the broth on medium high in a shallow stainless steel skillet with tight-fitting lid on. When broth begins to steam, add garlic, ginger, red onions, red bell pepper, and shiitake mushrooms and sauté for 2 minutes, covered with a tight-fitting lid. Next, add in this order: chicken, scallions, broccoli, Napa cabbage, remaining 3 TBS broth, rice vinegar, and tamari (and chili flakes, if using). Cover and steam over medium heat for 5 minutes. Do not stir or remove lid. Turn off heat, stir in 2 TBS extra virgin olive oil, and sprinkle with sesame seeds. If you are using rice, add that to a large bowl, and top with the vegetable and chicken mixture. Serve immediately. Note: If you wish to use the large broccoli stem, cut off the bottom 1 inch of the stem. Peel the tough skin off the stem. Chop stem into ¼ inch pieces and cook with the rest of the broccoli. Ed Shepherd is the owner of KickBox-SuperFIT in West Palm Beach, Florida along with his brother Steve Shepherd a 5X world champion kickboxer. 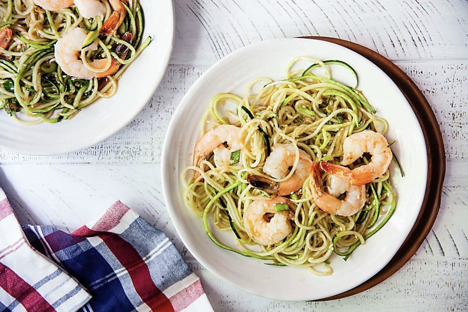 Top these ginger sesame zucchini noodles with shrimp for a healthy summer dinner that’s ready in just 10 minutes. This recipe is also great served cold, so it’s perfect for meal prep! I haven’t been eating a lot of pasta lately, and I was even more excited about the idea of making it with zucchini noodles! I added some shrimp for protein and was really happy that such a healthy and delicious dinner could come together in just about 10 minutes. Zucchini noodles are easy, tasty, and go with just about anything, and zucchini noodles are exactly what they sound like – fresh zucchini that’s cut into long, noodle-like strands. Since zucchini doesn’t have a lot of flavor on its own, they take on the flavor of whatever you cook them with and they’re a fantastic low cal and gluten-free alternative to pasta. You can use a spiralizer or a box grater to cut them yourself (a great option in the summer when zucchini are cheap and plentiful!) or you can buy them pre-cut (look for them in the produce section.) I’ve also tried frozen zucchini noodles, but I don’t recommend them since they can be pretty soggy. Kathleen and I love them with red sauce and meatballs, in zucchini noodle pad thai, or sautéed with fresh herbs + hazelnuts. You can boil them for a minute or two or sauté them. Or, you can eat zucchini noodles raw! That’s been my favorite way to enjoy them recently because they have a firmer texture, and it’s how I made these ginger sesame noodles. Heat the oil in a large skillet set over high heat. Add the shrimp and cook 4-5 minutes, or until bright pink and cooked through. While the shrimp cook, combine the coconut aminos, sesame oil, ginger, garlic, green onions and sesame seeds in a large bowl. Add the zucchini noodles and toss to coat. Divide the zucchini noodles between two plates. Top with shrimp. These colourful fritters are unbelievably delicious. They give you the impression of being substantial and really rather naughty, but leave you feeling light and bright. To make the dressing, whisk the ingredients together and set aside. To make the fritters, whisk the eggs in a large bowl and add the sweetcorn and broad (fava) beans. Add the flour and stir well to combine. Add the coriander (cilantro) and chilli with the lime juice, season with the salt and plenty of black pepper, and stir in. Heat a little sunflower oil in a large frying pan and, working in batches, cook spoonfuls of the mixture on both sides, until golden. Depending on the size you want, use 1 or 2 tablespoons of mixture for each fritter. Serve the fritters with the Feta, Cucumber and Spinach Salad (see next recipe) and accompanied with the dressing. Sweetcorn is one of the highest sources of vitamin D – so not only do they look sunny, they are!